Definition of Mythical Creatures: What are Mythical Creatures? Mythical Creatures are legendary beasts, monsters or massive animals that are based on the stories, myths and legends of the different tribes of Native American Indians. These mythical creatures have been brought to life in stories, dances, ceremonies and works of art. The stories, legends and myths relating to Mythical Creatures are stirred by explanations of the unknown and the supernatural. Misguided ideas, speculation, fear, or imagination have inspired the development of many legendary monsters and mythical creatures that are found in the culture of Native American Indians. "... as large as a calf, with horns like a deer, red eyes, a beard like a tiger, and a frightful expression of countenance. The face is something like that of a man, the body covered with scales, and the tail so long that it passes entirely round the body, over the head, and between the legs, ending like that of a fish." Mythical creatures are also based on the basic fears that people have of real animals such as snakes. These fears are escalated even further by the addition of even more frightening supernatural characteristics and physical attributes, such as a monstrous size and exaggerated teeth and the addition of horns. The Avanyu is one of the many snake-like mythical creatures that figure in the mythology of some Native American tribes, notably the Pueblo. 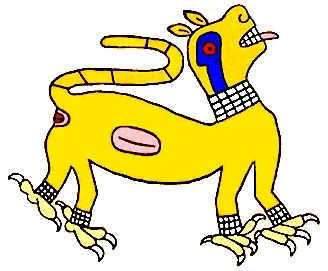 This mythical creature is represented by a horned serpent, or snake. The Avanyu, represents the underlying mystery that people have felt towards the snake that have led to the legend of this mythical creature. The addition of horns or antlers frequently appear in descriptions of legendary creatures and beasts. Antlers and horns signified spiritual power, especially when applied to animals that did not ordinarily have them such as birds and snakes. The legends and stories of many of these monsters, beasts and creatures date back thousands of year to the most ancient cultures of North America. Mythical Creatures - The Feathered Serpent or "Sky Snake"
The Feathered serpent is another of the mythical creatures that feature in the mythology and legends of the indigenous people of North America. 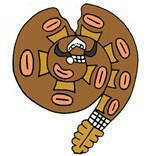 The feathered serpent is also known as the 'Skysnake'. The Abenaki tribe told of a great serpent called the Kita-skog meaning "Big Snake" or Pita-skog meaning "Grand Snake". The Algonquin believed that crossing a bridge in the shape of an enormous serpent would lead to the road of the afterlife. 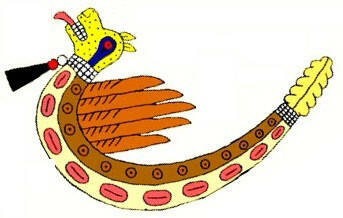 In Apache legends and mythology a deity called Gucumatz was a Feathered Serpent. The Panther was believed to be a supernatural deity who lived in the Underworld with the spirits associated with death and destruction. These creatures, or monsters, were referred to as "water panthers". The Panther is seen as a malevolent being or monster who fights then devours his enemies and was strongly associated with warfare. The Water panther is a powerful supernatural creature in the mythological traditions of some Native American tribes including the Algonquians, Ojibwe and the Potawatomi. 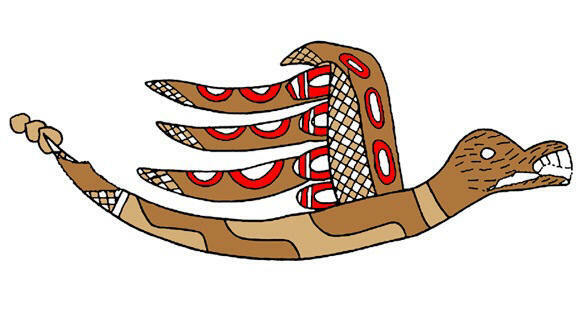 In these cultures the underwater panther is in opposition to the Thunderbird. 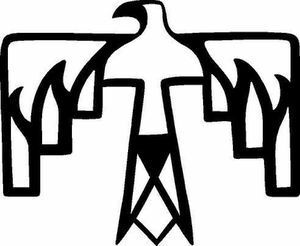 The Thunderbird is probably the most well known of all the monsters, beasts and creatures associated with the North American Native Indians. 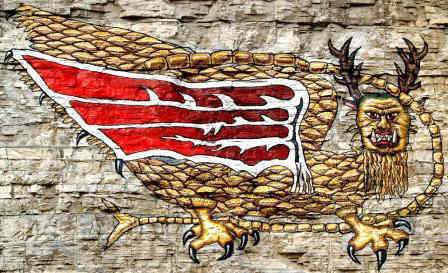 The thunderbird is depicted as a large raptor-like bird usually with curling horns, long legs, a long beak and a featherless head. Sheet lightning is believed to flash from its eyes when it blinks, and individual lightning bolts made by the glowing snakes or serpents that follows it. 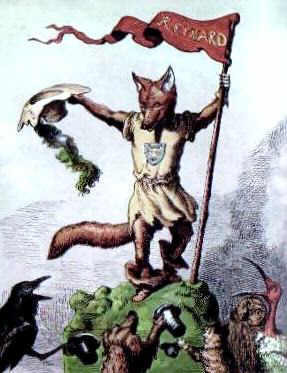 Mythical creatures called Tricksters were associated with most of North American Native Indian tribes and are often identified with specific animals, such as the coyote, spider and raven. Tricksters are mischievous supernatural beings who take the form of animals. Monsters, Beasts and Supernatural Creatures. Discover the vast selection of pictures which relate to the History and Culture of Native Americans. The pictures show the clothing, War Paint, weapons and decorations of various Native Indian tribes that can be used as a really useful educational history resource for kids and children of all ages. We have included pictures and videos to accompany the main topic of this section - American Indian Mythology & Monsters, Beasts and Supernatural Creatures. The videos enable fast access to the images, paintings and pictures together with information and many historical facts. All of the articles and pages can be accessed via the Native Indian Tribes Index - a great educational resource for kids.